Why has the decision-point between laser and inkjet printers changed? How much was expected to be printed (volume). What quality performance (particularly archival) was necessary. The results of the decisions associated with these two criteria meant ink went into consumers homes and small offices (SOHO) while laser went into business environments. Because of the performance differences, consumers have become conditioned to think ink equals SOHO and laser equals business but, over the last five years or so, these differences have been mostly eliminated. This means, if consumers can separate the way they've been conditioned to think and set aside the stigma traditionally associated with ink in a business environment, then the decision between an ink-based platform and a laser-based platform can be made based on the total cost of ownership (TCO) rather than historical performance differences. In eliminating the performance gap between inkjet and laser, the choice of technology platform becomes irrelevant, thereby making it possible for consumers to select a printing device based on the economics alone! First, we'll focus on the two main components of performance that separated the platforms for so many years. Print speed and print volume have an inverse relationship in the decision making process because the greater the print volume requirements are, the more important the speed of output becomes. In the past, the speed of inkjet printing was limited because the printhead that delivered the ink had to travel across the paper before the paper could be advanced. There was only so fast a printhead could be advanced across the page as it printed (for example) a quarter-inch swathe. This meant, for a print area of ten inches by seven inches, as many as forty bi-directional seven-inch passes across the page were necessary, with the paper limited to advancing in quarter-inch increments after each pass. To print one page meant the printhead and paper combination had to travel more than 23 feet. In the early days of inkjet technology, the size of the ink droplet was relatively large (20+ picoliters Vs. 2 picoliters today) which meant the amount of ink deposited on the paper was greater. This meant the ink took longer to dry and, the faster the print, the greater the problem of one page potentially smearing the output of a previous one as it slid into the output tray. What does a picoliter mean for inkjet printing? It is a trillionth of a liter - pico denotes a trillionth just as nano represents a billionth! It's a very small droplet! Just because the individual droplets may have been 10-times bigger it didn't mean (in total) there was 10-times the amount of ink on the paper because, although the droplets were bigger, there were far fewer of them. However, it did mean the sharpness of the print output was visibly inferior to that which could be obtained from more expensive mid and high-range laser printers. Because of the relatively large droplet size, it also meant the individual droplets took longer to dry than the much smaller droplets placed on the paper today. Just imagine drops versus a fine mist; everyone conceptually gets the idea the mist dries quicker than than the drops. For those who remember the early days of inkjet printing they probably also remember how the paper had a damp feel and crinkled appearance because of how much ink had been placed onto it. Then there was the issue associated with the limited permanence of the ink that could lead to the print fading within a few months of printing. For businesses archiving important documents that may need to be retrieved three or four years later (perhaps 15 or 20 years later) only to find the print no longer be visible, this was a big problem. This issue alone made ink unsuitable for use in financial, legal, medical, as well as most other business environments. Manufacturers have overcome the fundamental speed limitation on inkjet technology by introducing page-wide printhead arrays. 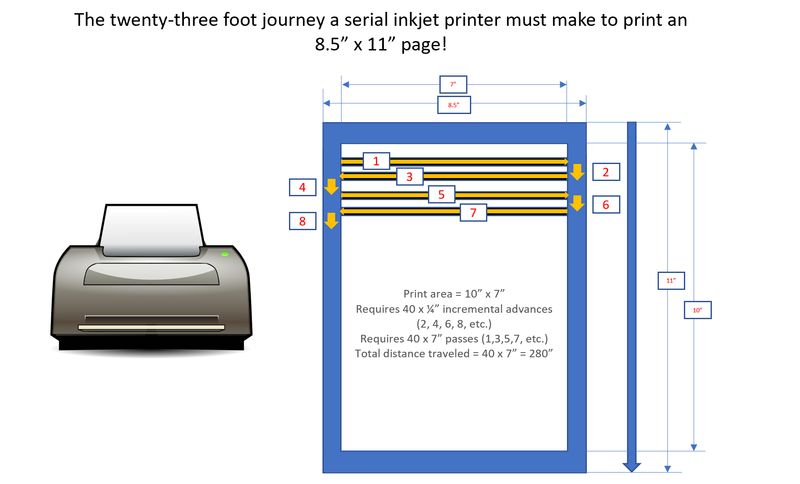 These arrays may print a half-inch swathe (or more) at a time, so it only requires twenty half-inch paper-advance increments to print a full 10-inch page. Instead of the printhead and paper combination having to travel 23 feet, only the paper travels, and it only travels 10 inches, which is 95% less travel than old, non-array systems. In other words, the print speed issue in page-wide inkjet printhead array systems has been solved. Both the printhead and the ink have a say in the quality of the print output. The printhead because it governs the amount of ink placed on the paper, exactly where the droplets are placed, and how much ink is contained in each droplet. The chemistry of the ink itself is of course critical and has greatly advanced over the last 30 years with ultra-fast dry times and archival tests, conducted by the major manufacturers, indicating up to 100 years of permanence. In other words, the print quality issue in modern inkjet based printer systems has been solved. With the speed and quality issues solved, consumers can now make an ink versus laser decision based on the economics (cost of ownership) rather than the technology platform. However, obtaining sufficient information to understand the economics and make an informed decision is not easy. How many pages are currently printed? How many are expected to be printed in the future? How many pages are color versus mono? Which printers (ink or laser) are the best fit for the expected print profile? What are the costs of the printers that fit the profile? What is the yield of the ink or toner cartridges? What is the cost of replacement cartridges? It is only once this information has been obtained that the total cost of ownership (TCO) over the expected lifetime of the printing device can be calculated. However, because there are many different printer options available from many different manufacturers, a lot of information must be gathered, and many calculations performed, before a comparative TCO on a range of machines can be accomplished. Map its print requirements profile to all the potentially suitable printers available from a dozen or so manufacturers that offer ink or laser-based printer and copier devices? Begin the task of gathering all the information needed to calculate the TCO for each of the different options? Is the printer required for a business or a SOHO environment? The printing environment (whether business or home) is still used as a filter to decide whether an ink or laser printer should be selected ... and then the sticker price seals the deal! However, as we've explained, using historical performance characteristics to determine suitability for different printing environments should no longer be a factor in making a selection. Unfortunately though, removing this filter from the process just serves to increase the number of different printer options to consider, thereby making the comparison on all the potential alternatives even more difficult. Most consumers (business or SOHO) will not do all this work and, as can probably be imagined, the two obstacles of complexity and time result in many (probably most) printer acquisition decisions becoming bad decisions. How bad a decision is generally closely related to the amount of print (throughput) that the printer is required to process. The sticker-price (i.e. the lowest price option) is often a key factor in the purchase decision but only represents a small percentage of the lifetime cost of ownership. As we'll see, regardless of the print volume, a bad decision can result in the TCO being more than twice that of a "good" decision. To support this assertion consider the following example. Four-year lifetime and average monthly print volume of 2,000 pages, with a "peak" volume of 4,000 pages per month (seasonal). 43% monochrome (black) print and 57% color print. We selected four different print devices for the evaluation, three ink and one laser with the key data points summarized in the table immediately below. The most important data established from the case study results are shown in the highlighted cells, with green representing the lowest data-point and red the highest. To help more readily visualize the results of the study, these key data-points are also presented in the chart immediately below. The PageWide Pro 577DW has the lowest overall 4-year cost of ownership and the LaserJet M577f the highest, at more than two-times the former. Furthermore, the PageWide inkjet printer has the fastest maximum output speed of 55 pages per minute (PPM) versus the slower and more expensive LaserJet with only 40 PPM. Although the lowest cost device considered in the case study is the Epson Workforce Pro WF4720, it's not suitable for the print environment because its peak recommended monthly throughput is well below the expected average requirement, and even further below the expected peak throughput requirement. For this reason, this device must be eliminated from contention. The HP LaserJet should also be eliminated from contention because it costs more than twice as much to operate as the lowest TCO PageWide Pro device. 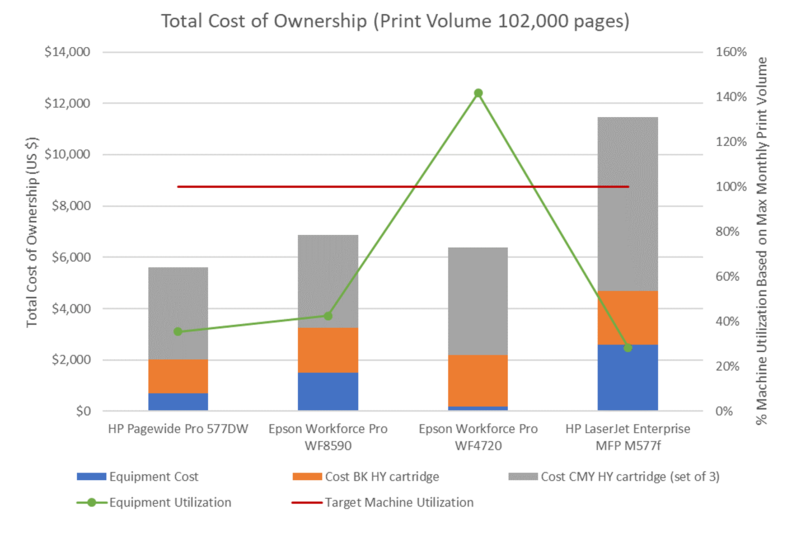 The PageWide Pro device has the lowest initial acquisition cost (after eliminating the unsuitable Epson Workforce Pro WF4720), and can comfortably handle the expected peak output demand of 4,000 pages per month as this volume represents only 66% of the manufacturers recommended maximum monthly throughput. 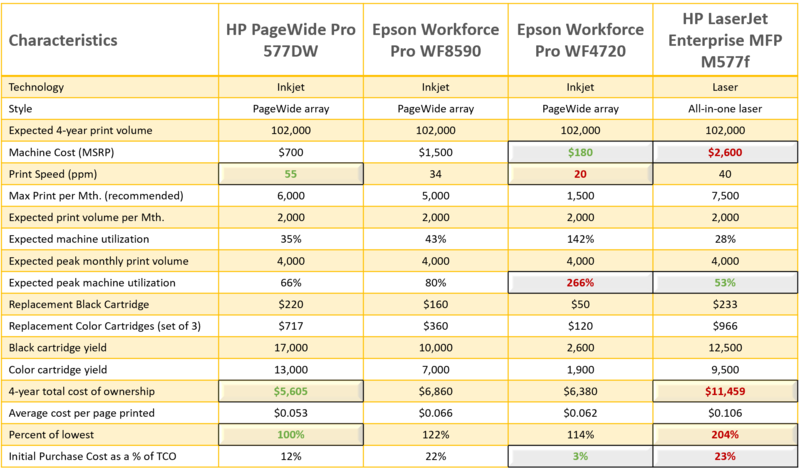 The customer should select either the HP PageWide Pro device or the Epson WF8590 as its best economic decision as the TCO for either of the devices is within 15% of each other. Any brand preferences aside, the strictly correct economic decision is the HP PageWide device because it's the very lowest cost option under consideration. In the scenario we've explained, a consumer going with the traditional preference of "laser for business" will make the mistake of acquiring the LaserJet device and will subsequently incur more than two-times the 4-year TCO than could have been realized with the PageWide Pro inkjet device. Alternatively, the consumer making a decision to select the device with the lowest upfront acquisition cost will not only fail to make the very best economic decision, he or she will also make a bad decision in acquiring a piece of equipment that's not designed to meet either the peak, or the average monthly throughput requirement. A capacity (utilization) error like this usually occurs when the consumer doesn't know its actual monthly print volume and therefore fails to take this metric into account when making the purchase decision. Do you know your print volumes (throughput) on each of your printing devices? Learn more about our Free Printer Management App that puts all this information on a dashboard while also informing you of the ink and toner levels, and the projected cartridge replenishment dates for your networked printing devices. We hope you've gained a better understanding from this article just how difficult it is to figure out what the best economic decision is as you attempt to select the best printer or copier to meet your needs. Why not experiment with our Total Cost of Ownership Calculator to help with your "real-life" scenarios?